Session data for each test attempt are saved each time, and are retrievable (see our article about student session data), so it is quite easy to see if a student is attempting to "game" the system by just answering questions again and again. However, we also have several protections in place to make this behavior counterproductive and difficult for students. 1) EdReady deactivates the TEST button once a student has taken a test and not mastered the content. At this point, the student is directed to the study resources thru the LEARN button. 2) There are many questions available for each learning objective, and each test is assembled dynamically from questions that the student has not seen before. They may see some similar questions (e.g., in a word problem the context might be the same but the numbers used are different), but not identical. 3) The student is never explicitly told which questions they got right or wrong. They only find out at the end of the test that they did or did not demonstrate mastery of the material covered. Some students think they know what they got wrong based on how quickly or slowly the progress bar moves, but that is not actually an indicator of right/wrong on any given question. 4) The student's EdReady score will go down if they do poorly on Tests. 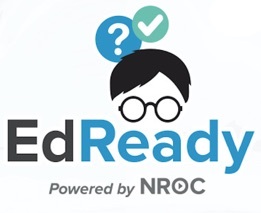 If the student is doing poorly on tests as a result of not studying, their EdReady score will actually go down. Since the goal of the "game" is to raise the EdReady score, this is a great check on the student who is trying to use testing inappropriately. Philosophically, it helps to remember that EdReady itself is not designed to replace a high-stakes test, but rather to prepare for such tests (or other expectations). So students who attempt to “game the system” are just gaming themselves. Getting to the target without actually filling their knowledge gaps is counter-productive to EdReady’s purpose. Our members have shared that they are warning students that simply raising their scores without gaining improved understanding is not the point, which is a good approach.